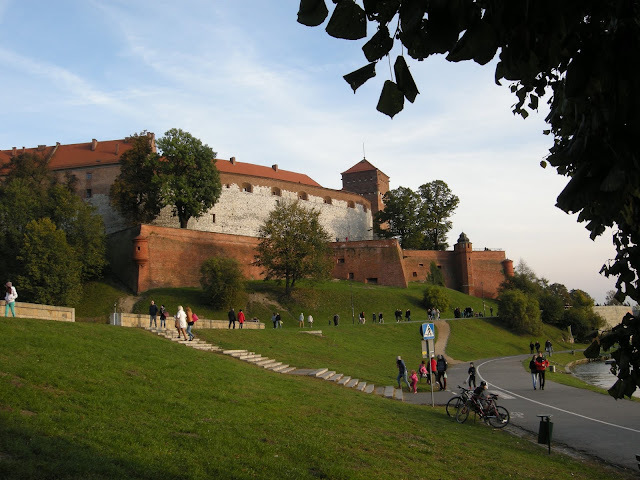 In spite of several vacations in Europe since 2008 and over a year spent living in Switzerland, I had never made it to Eastern Europe until recently, when I travelled to Krakow, Poland. This was an exciting first for me, an experience that I recommend highly. 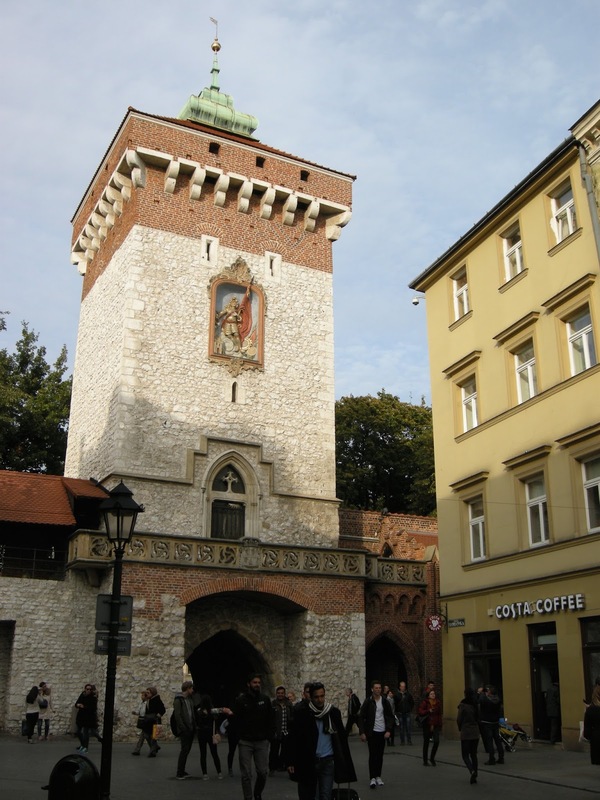 There is much to see – and like – in Krakow. 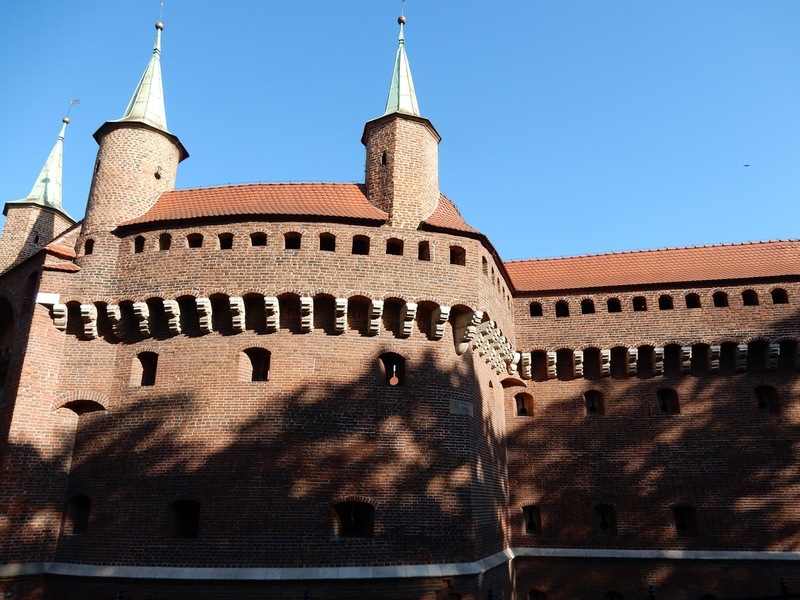 In fact, my trip to Poland will require two blog posts. Here is the first, with a focus on the ancient city. Since this was a school trip, everything was organized for us. Early on a Friday morning, thirty-six students and four staff travelled by train to Zurich to catch our flight. The journey to Poland could not have gone more smoothly, so by mid-afternoon, we met our guide, Barbara, and boarded a bus which would take us to our hotel in the centre of the city. Not long afterwards, we headed out on a walking tour of this beautiful place. 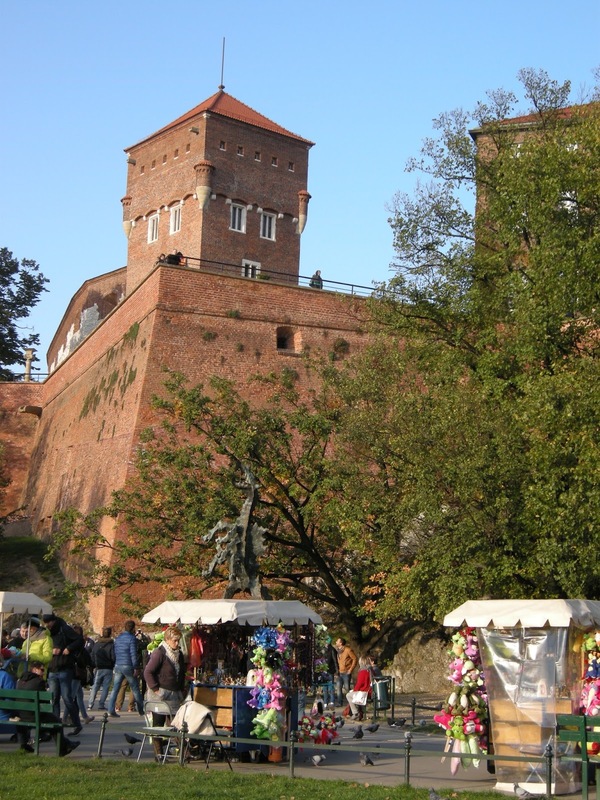 Luckily for the modern tourist, Krakow's character and buildings have remained intact because, unlike Poland's capital, Warsaw, it was untouched by WWII. 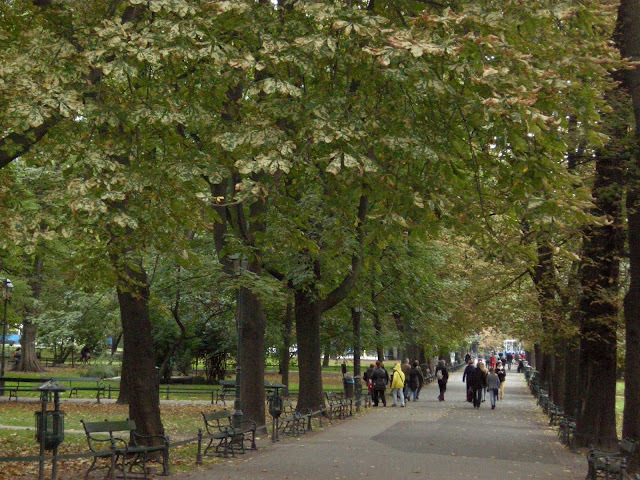 As a sort of protection of the city's medieval heart, a park encircles the old town. I discovered recently that city planners just filled in the original moat and then planted trees. What a great idea! At one end of the perimeter of the old city is the 15th century barbican, part of the original fortifications, and the Saint Florian Gate, while at the other, Casimir III's 14th Century Wawel Castle stands perched on the crest of a hill. 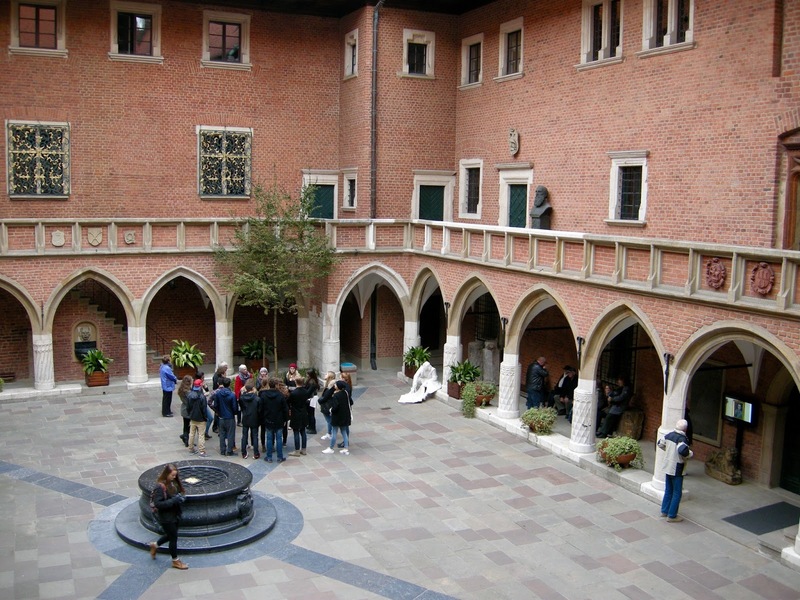 Krakow has a proud history as a centre for learning which has left it with several beautiful University buildings and quadrangles, the most impressive of which is Collegium Maius, where a statue to Copernicus honours the city's most famous son. Marie Curie also spent time in the city. Part of our group in Collegium Maius. 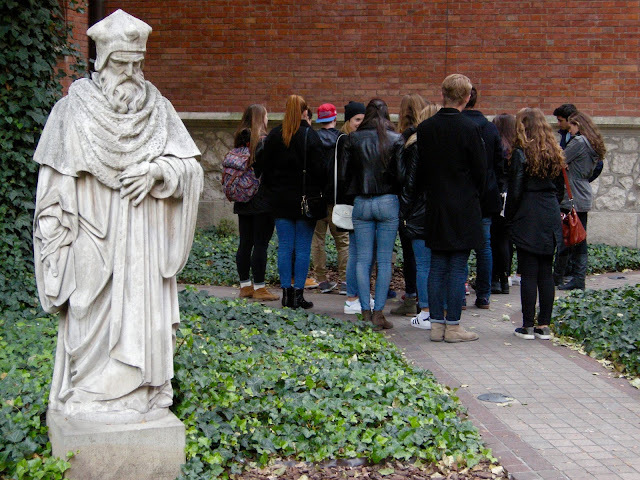 The white statue is of Copernicus. Beautiful building at the Jagiellonian University. There are coats of arms above each window. 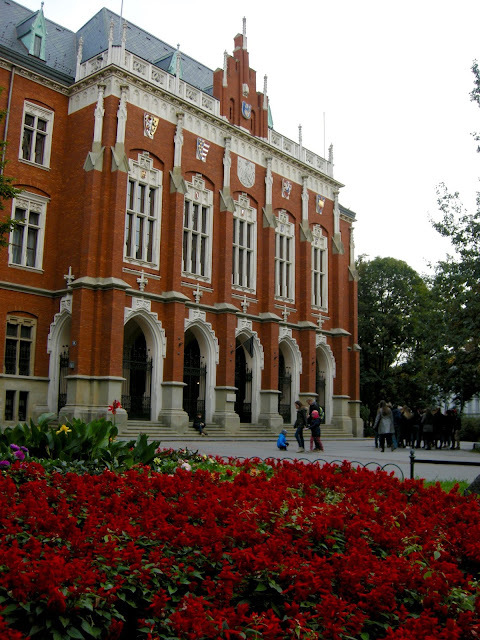 Although there are many worthy places to see in Krakow, the highlight of the city is the main square, which at 200 square meters is the largest one in Europe. It is a spectacular space! In the centre stands Cloth Hall, an indoor shopping mall erected in the 15th century. Here, you can buy amber jewelry of all sorts as well as other Polish products (and some from China too, no doubt). There are other buildings of note in the square as well, including the town hall tower and Saint Mary's Basilica. 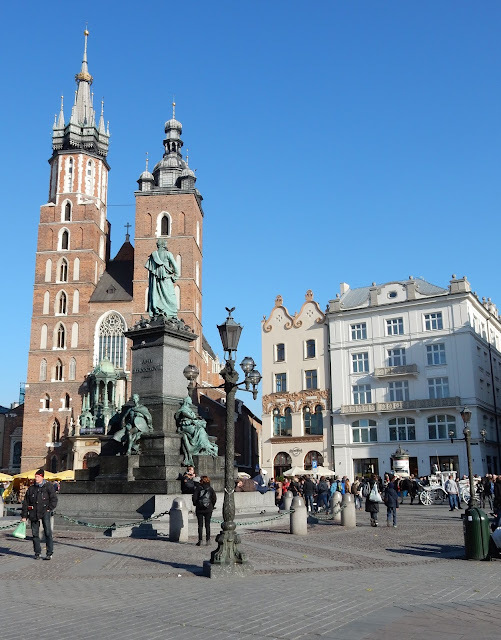 Saint Mary's Basilica and the Adam Mickiewicz monument. 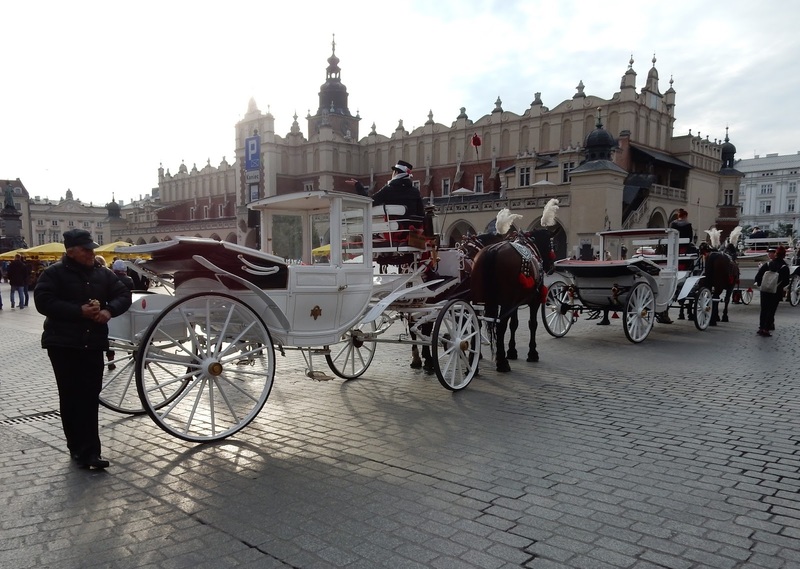 Although our itinerary took us to other places in Krakow, we always ended up returning to the square. We were not the only ones. One of the most attractive features of this part of Krakow is its liveliness. The plaza is always buzzing with people, especially in the evenings when heaters warm up outside patios of the many restaurants on its perimeter. 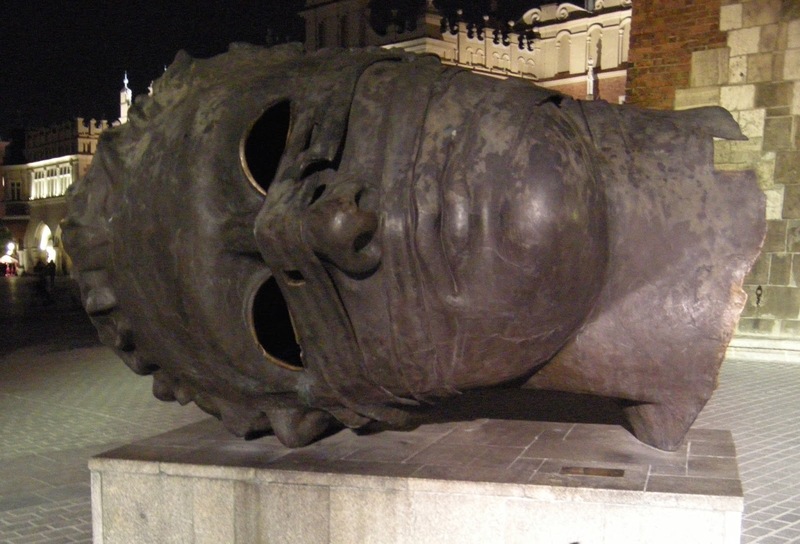 A unique sight in the square is the Eros Bendato by Igor Mitoraj, a sculpture of a head with a blindfold over the eyes. It is common for tourists to climb inside it and look through it. Our first walk though Krakow was an orientation of sorts, so that buildings were merely pointed out to us. 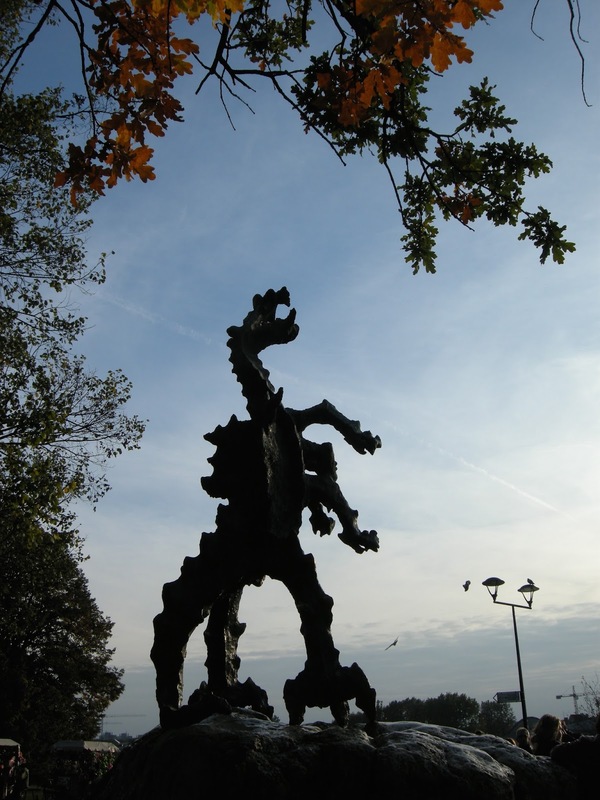 I wish there had been more time to explore the castle, the basilica nearby, and the walkway beside the river where a symbol of the city, the Wawel dragon, breathes fire every few minutes. 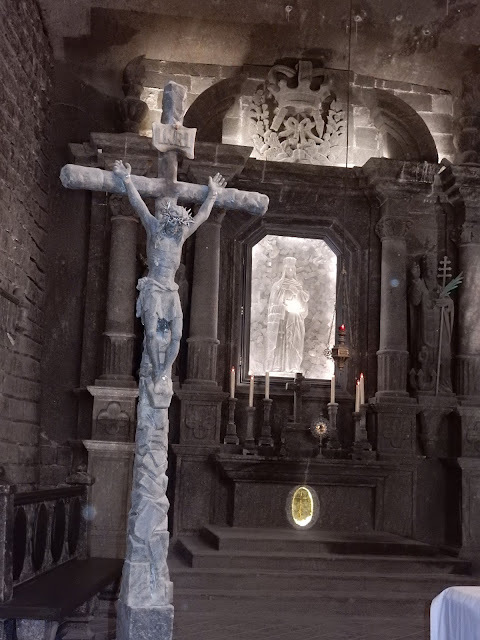 On our second day in Krakow, we were taken by bus to the Wieliczka Salt Mine on the outskirts of the city. Before I saw it, I could not imagine why a salt mine would be a major tourist attraction, but, based on the crowds lined up, it clearly was a very popular site. The entrance to the salt mine. Now I know why! 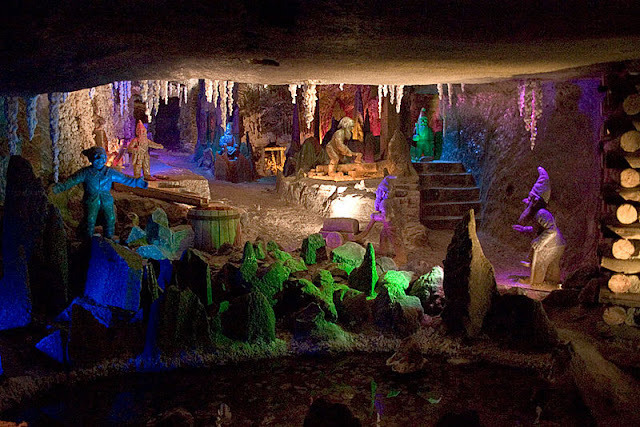 We spent over two hours underground in this place and it was truly awesome. 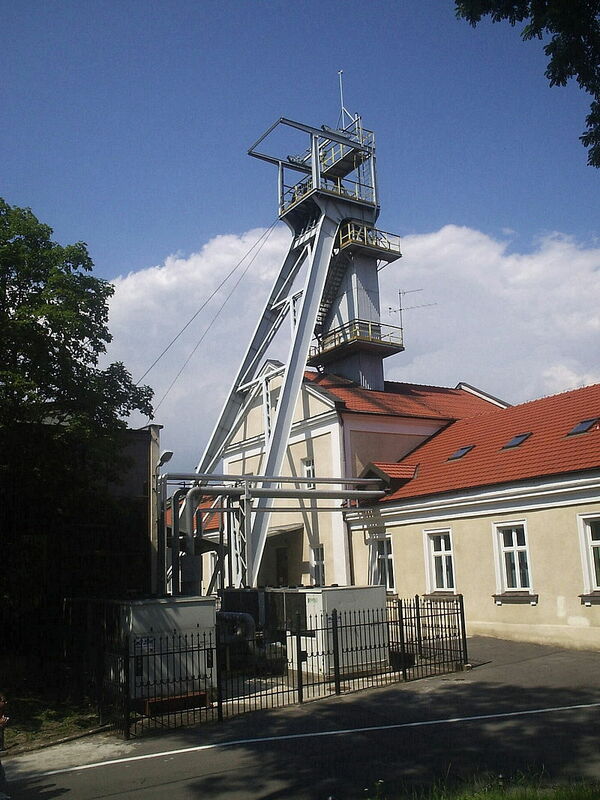 Here is a little history lesson: the mine began operation in the 13th century. At that time, and for centuries afterwards, table salt was a valuable commodity. (Trivia fact: the word salary comes from the word salt.) For over eight centuries this mine operated, as the search for salt led the miners to burrow more deeply and more widely into the bowels of the earth. It is 327 meters deep and extends over 287 kilometres. In short, it is massive! In 2007, the mine closed. Salt had become so common and mining so costly, that it was deemed more economical to open the mine as a tourist attraction than to continue digging. 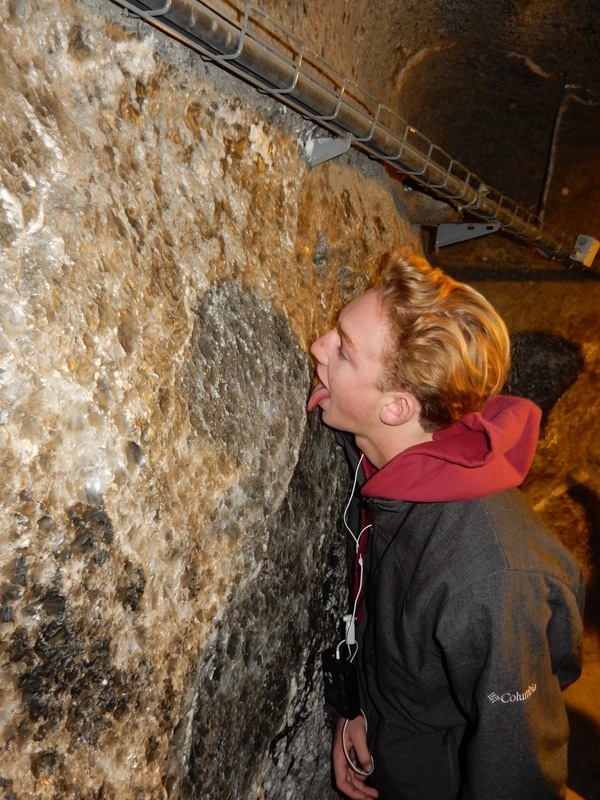 Alec tastes the salt on the walls. Now what the public sees are walls that still taste of salt – yes I stuck my tongue on the walls – but also wondrous caverns created over the centuries by human hands. 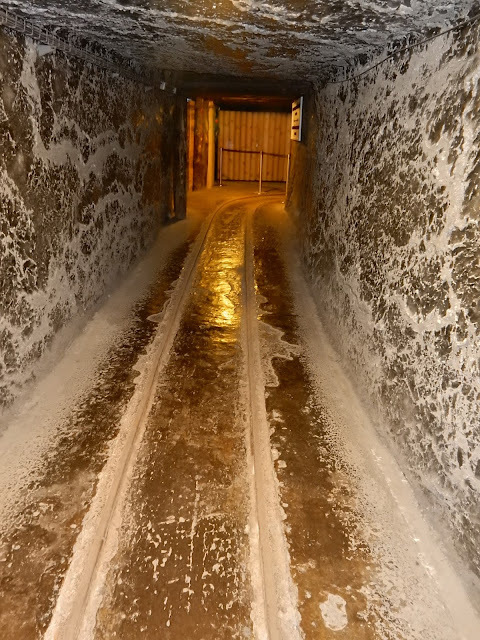 Bored and creative miners left their mark with room after room filled with "salt art". 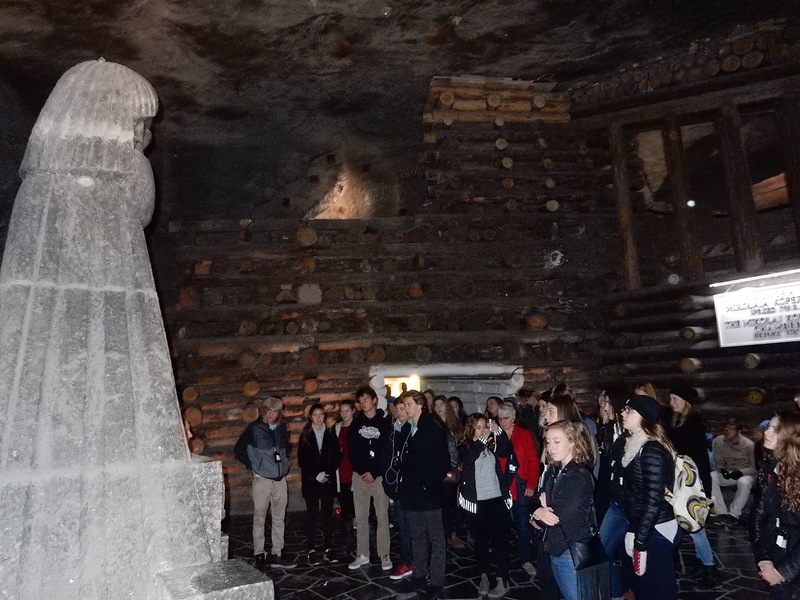 Our group in front of a miner's sculpture. The floor tiles are also made of salt. This was the first sculpture we saw. The seven dwarves, lit up. 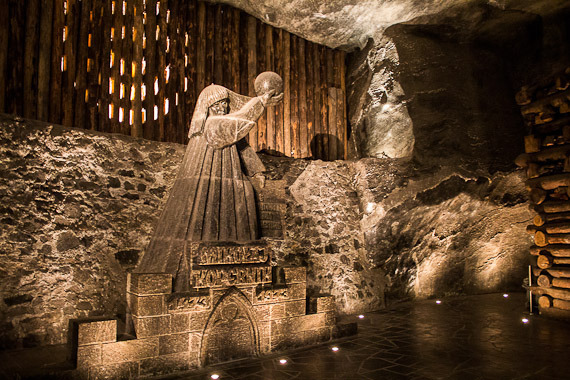 The most impressive space is the Chapel of St. Kinga, a beautiful room devoted to Catholic worship. 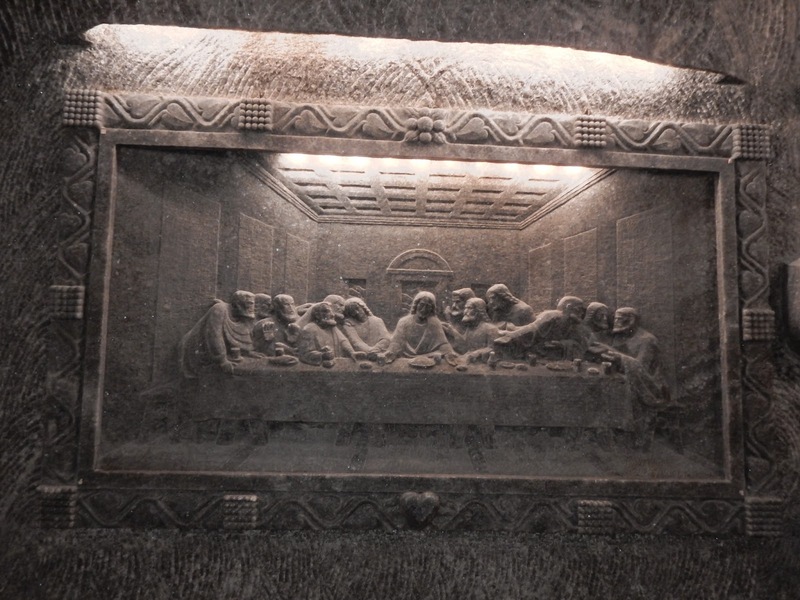 It is very large and is adorned with religious iconography. 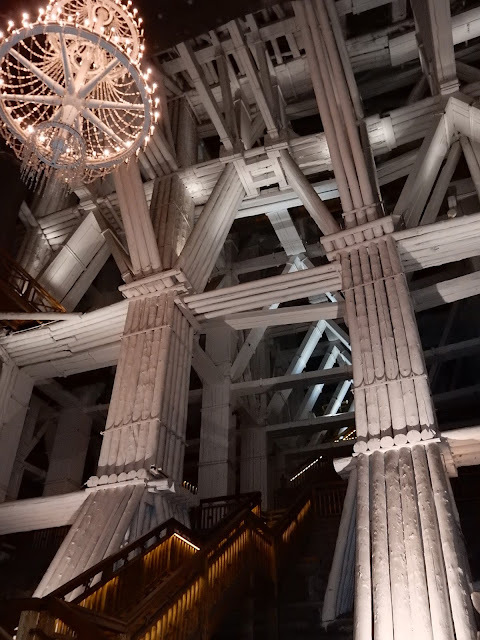 Everything, of course, is made of salt, even the chandeliers which are salt crystals. Awesome. Nowadays, the salt mine operates a large cafeteria and a restaurant in its depths and rents out some of its chambers to groups for gatherings or weddings. It is clearly a money maker! 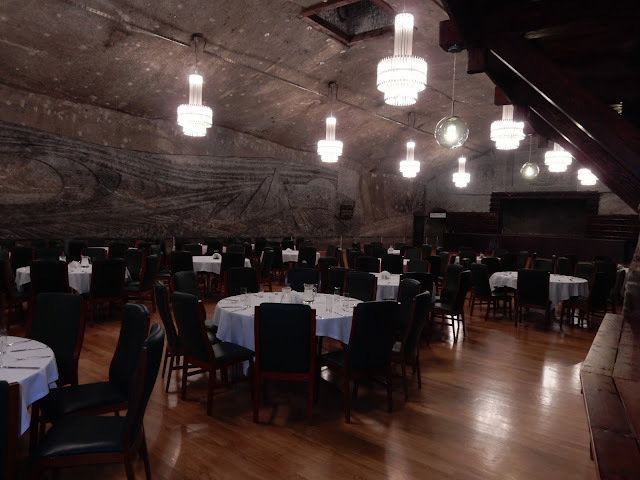 The salt mine dining room. 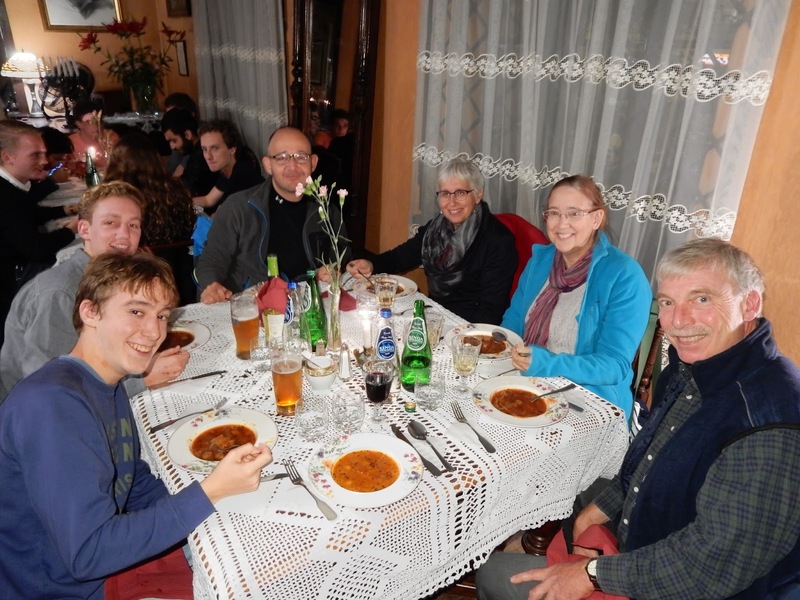 During our time in Krakow, we found other places to gather and dine as a group, however. One night, we headed to the old Jewish sector for a delectable traditional Jewish meal at the Klezmer-Hois restaurant; on another night, we feasted on Polish fare, including soup served in bread bowls and four kinds of perogies. This charming venue, Restauracja Wesele, was one of the many on the square. Alec and Jake joined their teachers for dinner.at the Jewish restaurant. 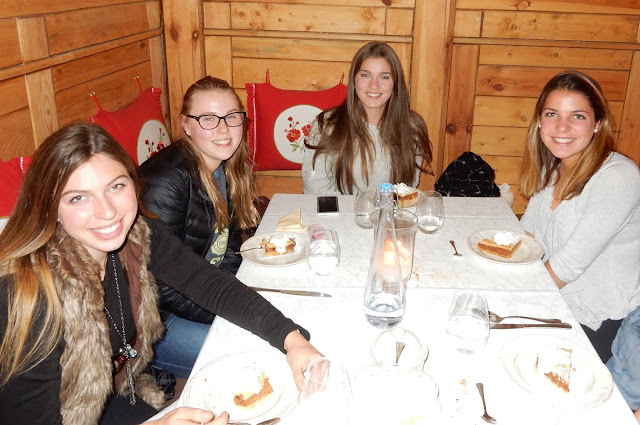 Brianna, Ellis, Rebecca and Andie enjoy dessert in a Polish restaurant. Krakow's long history, its fascinating architecture, its reputation as a centre of art and education and its many good restaurants make it a great place to see. In the next blog post, I will discuss the dark history of the area, another important reason to visit. 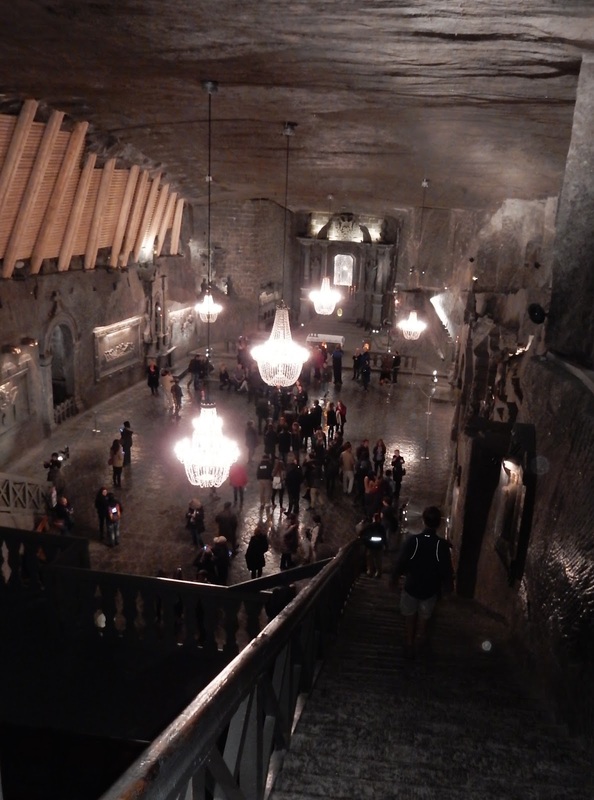 I the taste of Wieliczka was well worth the visit.